Not that long ago, people who grew their own vegetables or used grey water for irrigation were considered fringe tree huggers. Just four years ago I only had one friend that I knew of who grew her own vegetables. And look at us now. These days I get stopped in the queue at supermarkets by people wanting to show me photographs of their vegetables on their phones! And many more people are becoming aware that organic gardening is all about working and living in harmony with natural systems and minimising and replenishing the resources that we consume. And one of the most important resources in our climate is water. In the past, wars were fought over salt and graphite. Currently, wars are being fought over oil. In the very near future, wars will be fought over water. It is time to start thinking about our water supply and how we can save, harvest and recycle as much as we can. 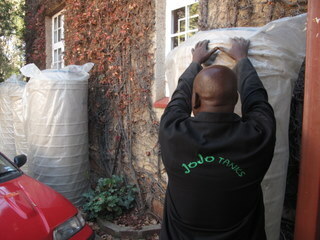 I have recently had JoJo tanks installed to harvest rainwater from my roof: 1mm of rain falling on one square meter of roof will supply 1 litre of water. 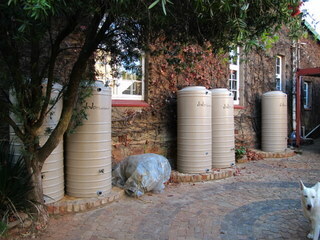 I have a large roof and all those litres currently wash away down the storm water drain – but I am really looking forward to the next rains when instead they will be saved into my tanks. I will let you know how it all goes when the spring rains come . 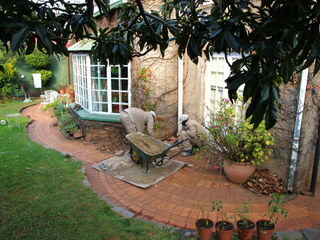 . .
Having a double storey house covered with very thick creeper caused a few hitches. 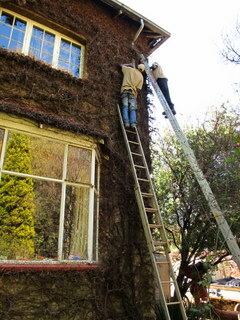 We had to hire an extra length ladder and the pipes had to be carefully adjusted as there was no way they were allowed to cut creeper branches that are probably 30 years old! 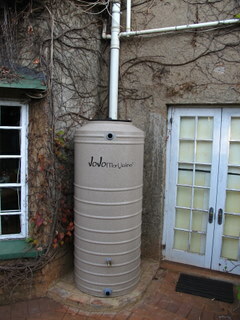 I have also installed a grey water system. I have learnt quite a bit about this in the last few weeks. Grey water comes from showers, baths, hand basins in the bathrooms and water from your washing machine. (It does NOT include water from the toilets, kitchen/ scullery sinks or dishwasher. This water is classified as black water.) 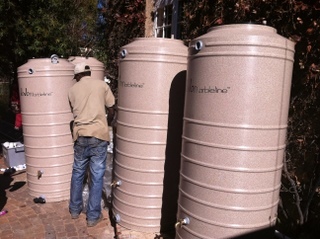 Firstly – if you are going to use grey water on vegetables you have two options: You must either use the water within 24 hours of it entering the tank or you must have a cleansing system in place. If grey water sits for longer than 24 hours, bacteria begin to get to work and it quickly becomes fetid and stinky. Not what you want on edible plants! So, I decided to install a slightly more complicated system from Free Rain (such a lekker name!!). 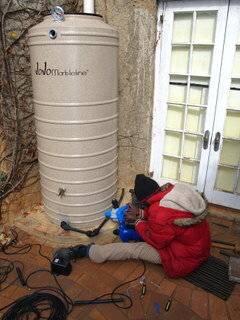 This includes a pump to circulate ozone into the water and an oxygenator in the tank. All of this keeps the water clear of any bacteria. As another precaution, the grey water is then fed from the tank, using a pressure boosted pump, into a drip irrigation system in the vegetable garden. The irrigations system uses soaker hoses that fill up with water and then slowly release it. This ensures that very little of the water is sprayed onto the leaves of my edibles, it all soaks directly into the soil – which of course being healthy soil full of organisms, acts as the final filter. Here is the before pic – this is a bougainvillea that never flowered and wasn’t in the right place as it alwys had to be kept cut back. And the end result. 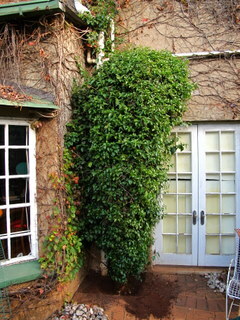 It is going to look even better in summer when the green creeper grows back around it. And, as a final touch, the JoJo tanks actually look attractive – they are the Slimline tanks that aren’t obtrusive and they are a lovely speckledy sandstone colour. Practical and pretty – right up my alley! It is something we should all be putting at the top of our “to do” lists.